LifeSource Talking Blood Pressure Monitor improves upon all of the innovations AandD Medical has created over its 30+ year history. during a measurement, wrinkles form on the inside of the cuff­. The material bunches up against a user's arm and creates discomfort. 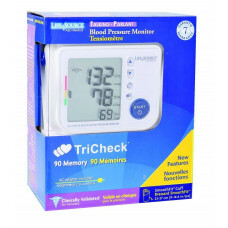 This monitor features TriCheck which takes three consecutive readings one minute apart. These readings can then be stored in the monitors 90 memory recall. The SmoothFit Cuff provided in this kit offers an advanced cuff design that will not pinch your skin. Irregular Heartbeat Feature and a clock and calendar.